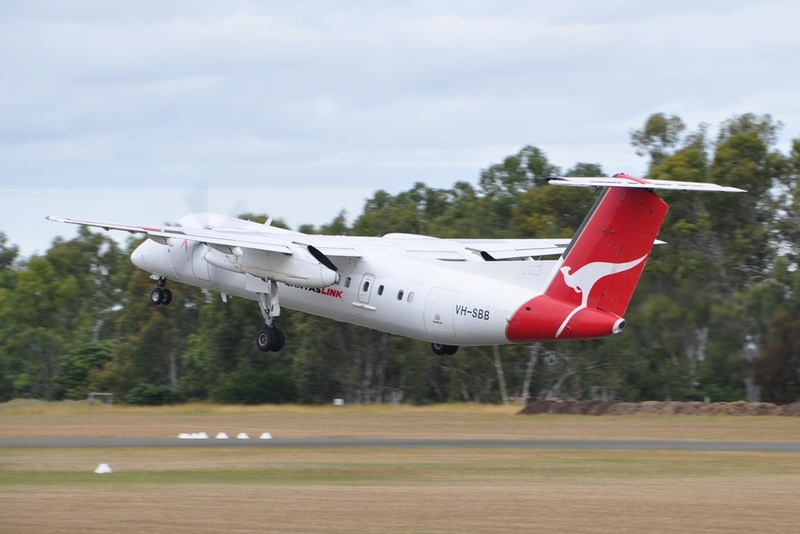 On Tuesday 31 January, the final Qantas flight in and out of Biloela / Thangool Airport was operated by QantasLink Dash-8-Q300 VH-TQE. It operated the morning QLK390/393 service from and back to Brisbane. 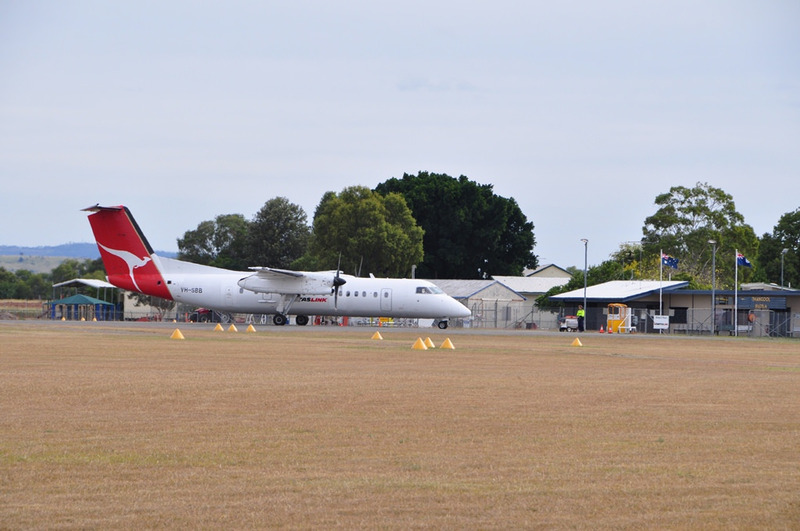 This marked the end of Qantas Regular Passenger Transport (RPT) services to Biloela / Thangool Airport after the airline announced the cancellation of the service in December last year. A Qantas spokesperson said the "very tough decision" was made due to low passenger numbers. Qantas has operated eight return flights per week on the route since late 2015, flying the 50-seat QantasLink Dash-8-Q300 aircraft to and from Biloela / Thangool Airport at least once each day except Saturday. 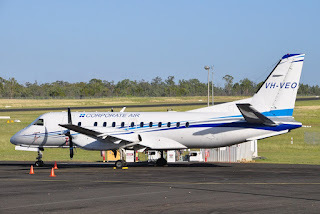 Fortunately for local travellers though, soon after the announcement that Qantas were cutting services, one of Australia's newest regional airlines, Fly Corporate (Corporate Air) announced that they would start (take over) flights to and from Biloela / Thangool Airport from Wednesday 1 February. The Fly Corporate schedule will offer afternoon return flights from Brisbane on Mondays and Fridays and morning return services every weekday. They will also offer a Sunday afternoon return service. Fly Corporate will operate 34-seat SAAB 340B Plus turbo-prop aircraft - a comfortable pressurised aircraft offering similar comfort and performance to the Dash-8-Q300. 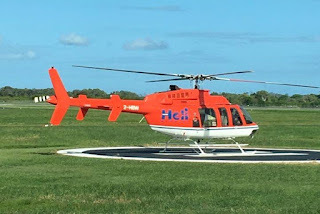 As we mentioned below, over the course of the weekend, Heli Niugini Bell 407 helicopter P2-HBW looked to complete a ferry flight South from Papua New Guinea (PNG) through parts of Central Queensland. Late in the afternoon on Saturday 28 January, it arrived at Mackay Airport from Townsville before continuing South on Sunday 29 January and being photographed by local plane spotter 'IAD' as it arrived into Rockhampton Airport. After taking on fuel, P2-HBW continued to Bundaberg Airport and points further South. Also arriving into Rockhampton Airport over the weekend was Babcock Mission Critical Services Australasia Bell 412 helicopter VH-LSY. It appears to have commenced operations with the locally-based Capricorn Helicopter Rescue Service (CHRS) as "Rescue 300". 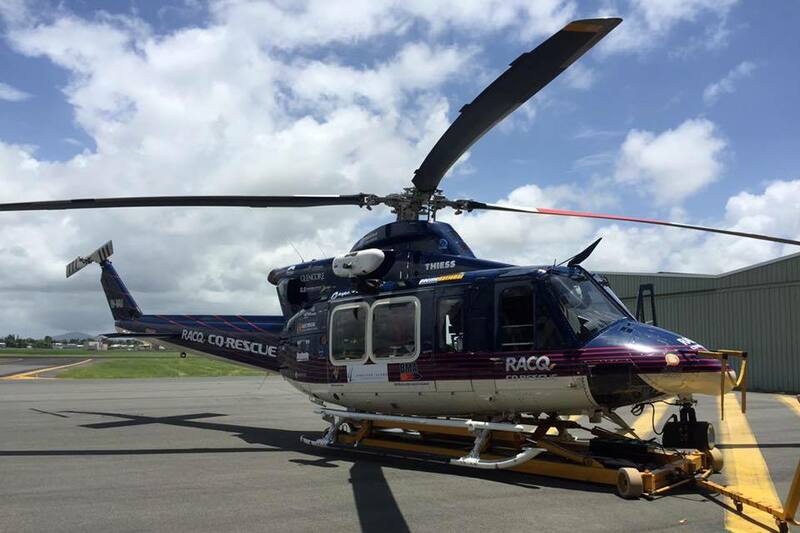 The 'regular' Capricorn Rescue "Rescue 300" - Babcock Mission Critical Services Australasia Bell 412EP VH-EPR - has positioned to Mackay Airport for planned maintenance. 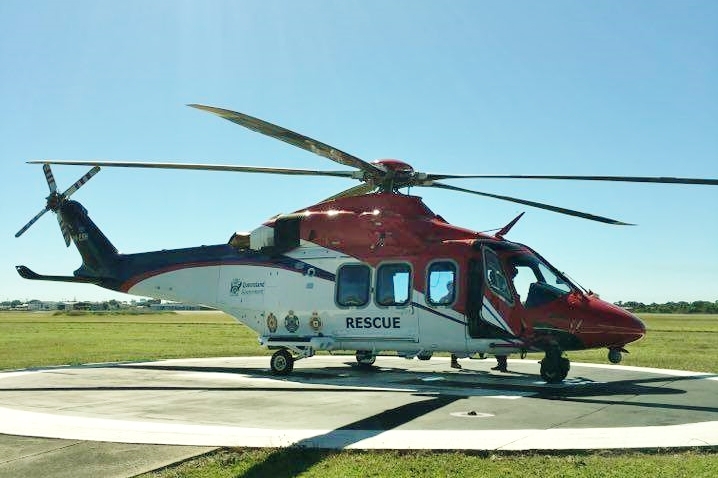 Of interest, currently operating out of Mackay Airport for the locally-based Central Queensland Rescue Helicopter Service (CQ Rescue) as "Rescue 412" is Babcock Mission Critical Services Australasia Bell 412EP VH-VAU. It arrived into Mackay Airport from maintenance at Coffs Harbour earlier in the year. The 'regular' CQ Rescue "Rescue 412" - Babcock Mission Critical Services Australasia Bell 412EP VH-CQJ - remains at Coffs Harbour undergoing planned maintenance. Sincere thanks to 'IAD' for taking the time to capture and send through these great photos!. As we mentioned on our Facebook page, Rockhampton was selected to hold a Queensland Government Community Cabinet Meeting on Monday 30 January resulting in two of the Queensland Government (State of Queensland) Airwing aircraft, along with the Queensland Police Service (Airwing) Cessna 560 Citation Ultra bizjet VH-PSU, bringing Ministers and support staff to Rockhampton Airport. 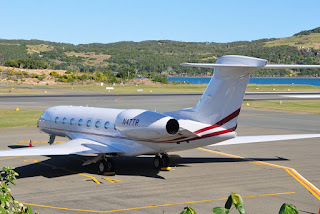 On Sunday 29 January, the Government's Raytheon Hawker 850XP bizjet VH-SGY arrived from Brisbane. It returned to Brisbane after dark on Monday 30 January. UPDATE! On Tuesday 31 January, VH-SGY returned to Central Queensland on what was reported to be a training flight. It touched down at Gladstone Airport for a very short time before taking to the air again and continuing to Rockhampton Airport. VH-SGY then departed and completed a 'single-engine take-off, circuit, missed approach and landing'. It then parked and was refuelled before returning to Brisbane. On Monday 30 January, the Government's Raytheon B300 Super King Air VH-SGQ arrived into Rocky from Brisbane. It remains parked. UPDATE! On Wednesday 1 February, VH-SGQ departed Rockhampton Airport for Townsville before later departing back to Brisbane. Police Citation VH-PSU also arrived into Rockhampton Airport on Monday 30 January from Brisbane. It also departed back to Brisbane after dark. Sincere thanks to local plane spotters Kayanne H and Trevor H for taking the time to capture and send through these great photos of some great visitors to the beef capital! 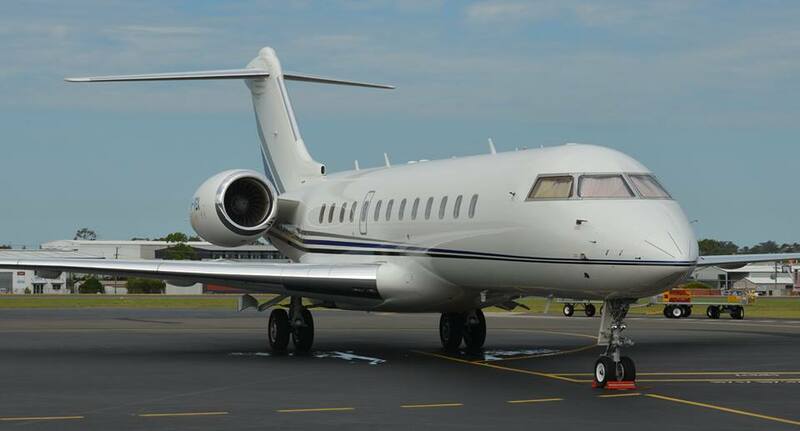 On Sunday 29 January, American registered Bombardier BD-700-1A10 Global 6000 bizjet N60XC was spotted on the ground at Emerald Airport soon after it arrived from Brisbane. The sleek bizjet is becoming a semi-regular visitor to CQ and on this visit, it arrived into Brisbane from Singapore on Saturday 28 January. At the time of writing, N60XC remains parked at Emerald Airport. 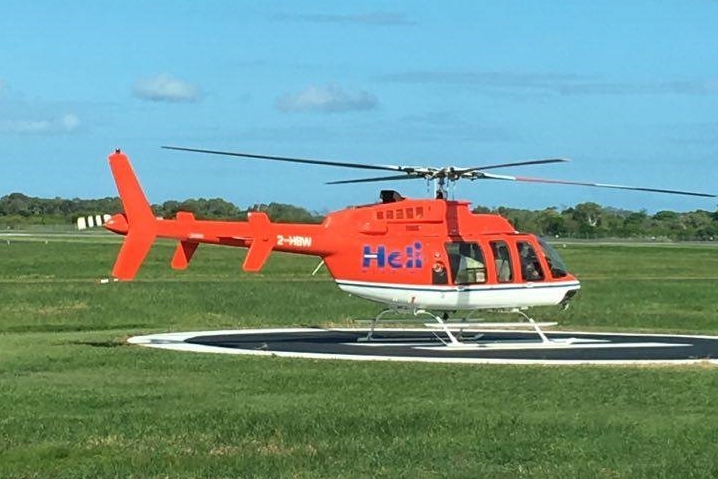 Over the course of the weekend, Heli Niugini Bell 407 helicopter P2-HBW looked to complete a ferry flight South from Papua New Guinea (PNG). Late in the afternoon on Saturday 28 January, it was photographed (above) shortly after arriving at Mackay Airport from Townsville. It was earlier noted departing Cooktown for Cairns and then Townsville. After spending the night, on Sunday 29 January, P2-HBW continued South, departing Mackay Airport for Rockhampton and Bundaberg Airports. It is believed that P2-HBW continued to further points to the South of Bundy. Certainly a nice surprise arrival into Roma Airport on Saturday 28 January was AVWest Aviation Gulfstream Aerospace G-VI Gulfstream G650 bizjet N47TR. The American registered - but Australian operated - bizjet looked to call in from the South. After some time on the ground, N47TR departed to Sydney. Vanguard Aviation Cessna 525 CitationJet1 Bizjet VH-DAA Pops into Rockhampton Airport - Plus More! 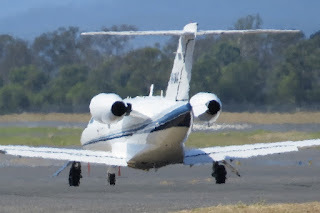 On Friday 27 January, Vanguard Aviation Cessna 525 CitationJet1 bizjet VH-DAA was spotted parked on the northern (usually military) hardstand at Rockhampton Airport by local plane spotter Kayanne H. VH-DAA had earlier arrived from its Archerfield base. After being parked for most of the day, the smart little Citation returned to Archerfield. Another bizjet that was noted visiting Rockhampton Airport twice on Friday 27 January was the Queensland Police Service (Airwing) Cessna 560 Citation Ultra bizjet VH-PSU. 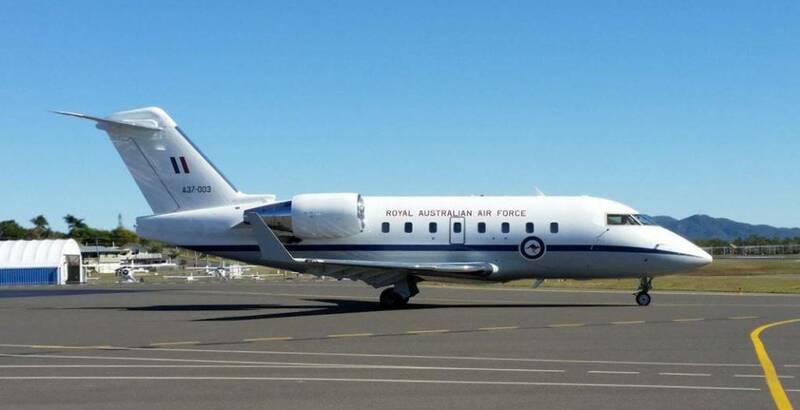 The citation looked to be yet again operating the three-times-a-week prisoner transfer flights for the Police with it also noted to have visited Mackay, Townsville and Brisbane Airports while starting and finishing its day in Cairns. VH-PSU also looks to have operated the prisoner transfer flights Wednesday 25 January, calling into Rockhampton and Mackay Airports again, along with Bundaberg Airport during yet another busy day of flying. A little smaller - and not quite a corporate bizjet - but also noted visiting Rockhampton Airport on Friday 27 January was the familiar sight of Cessna 208 Caravan VH-DJG which had earlier arrived from its home at Natal Downs - a cattle property near Clermont. It later departed to Archerfield. And a little smaller still visitor spotted parked at Rockhampton Airport on Friday 27 January was Brisbane-based Amateur built Lancair ES VH-DFH. 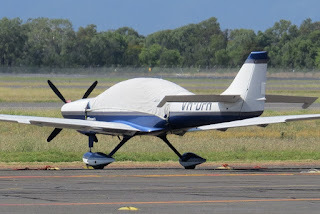 Of interest, locally-based R-Mach Aviation Lancair 4 VH-XVP has also recently been in the air, returning to Rockhampton Airport on Monday 23 January from Archerfield via Bankstown. Finally, it's worth noting that a visitor to Rocky last week in the form of recently registered Cirrus SR22 VH-XRR had again passed through CQ this time calling into Biloela / Thangool Airport while on another flight from Townsville to its Sunshine Coast base. VH-XRR flew north from the Sunny Coast direct to Townsville on Wednesday 25 January. 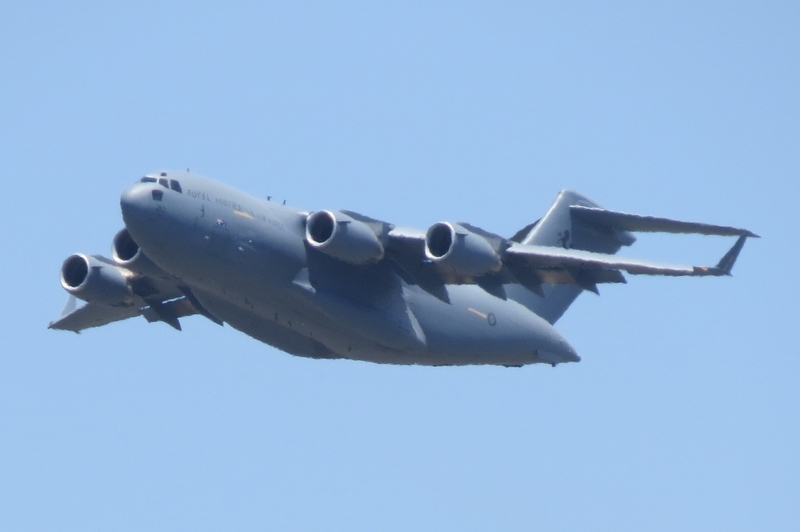 Sincere thanks to local plane spotter Kayanne H for taking the time to capture and send through these great photos! Thanks too to Trevor H for his help by providing information used in preparing this post! 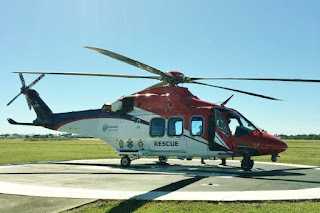 On Friday 27 January, it was interesting to note that a pair of Queensland Government (QGAir) Rescue (State of Queensland) Agusta AW139 helicopters VH-ESH and VH-EZJ simultaneously ferried North from Archerfield to Cairns and South from Cairns to Archerfield via both Gladstone and Mackay Airports. VH-ESH was noted ferrying from Archerfield to Cairns via Gladstone and Mackay Airports. Of interest, it has only this week been operating around the South-East corner of Queensland on med-evac flights as "Rescue 500". And almost immediately after arriving into Cairns, it was noted completing med-evac flights in the region as "Rescue 510". Meanwhile, VH-EZJ was noted ferrying South from Cairns to Archerfield via Mackay and Gladstone Airports. VH-EZJ has been operating out of Cairns Airport as "Rescue 510" during the early part of this week and I presume that it has ferried South as a part of their maintenance 'rotational system'. This is reportedly designed to ensure the even distribution of flying hours on each of their helicopters, thus avoiding the need to have multiple helicopters offline for simultaneous scheduled maintenance. QGAir helicopters usually ferry one day after another so having two ferry at one and cross paths is certainly a new occurrence. 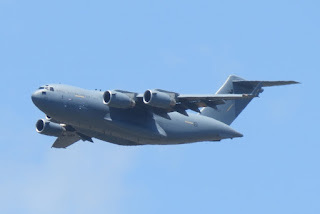 On Friday 27 January, Royal Australian Air Force (RAAF) Boeing C-17A Globemaster III transport aircraft A41-213 was photographed by local plane spotter 'IAD' as it completed a low overshoot of Runway 15 at Rockhampton Airport. A41-213 - flying as "Stallion 26" - had flown North from RAAF Base Amberley to complete the airwork at Rocky. From Rockhampton, it then flew West where "Stallion 26" was noted completing another low overshoot at Emerald Airport. 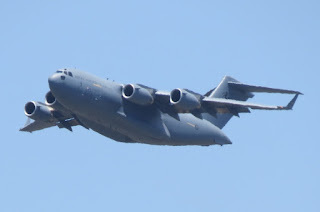 After this, the Globemaster returned to Amberley at flight levels. Sincere thanks to 'IAD' for taking the time to capture and send through these great photos! During the afternoon on Wednesday 25 January, LifeFlight (Aeromed) LearJet 45 bizjet VH-VVI "Ambulance 451" arrived into Bundaberg Airport from Brisbane. After around 30 minutes on the ground, it departed to HMAS Albatross at Nowra in New South Wales. HMAS Albatross is also known as Naval Air Station Nowra and is an airfield operated by the Royal Australian Navy (RAN), in support of the RAN's aviation branch, the Fleet Air Arm. VH-VVI also visited Emerald Airport early on Friday 27 January, touching down from Brisbane. It looked to be completing a medical evacuation flight and returned to the capital a short while later. As we've reported at various times previously, General Aviation Maintenance (GAM Air) operate one of their fleet of AeroCommander 500-S Shrike aircraft on a week daily freight run from Emerald to Longreach Airport via Barcaldine. Early on Tuesday 24 January, GAM Air AeroCommander 500-S VH-UJV was noted arriving into Emerald Airport from Brisbane and almost immediately departed on the run to Longreach. To my knowledge, this is the first time that this particular GAM Air AeroCommander 500-S has been mentioned on the CQ Plane Spotting Blog. VH-UJV was photographed back at Emerald Airport later on Tuesday 24 January after arriving back from Longreach and Barcaldine. Of interest, VH-UJV has predominately been operating in Victoria and New South Wales and first flew into Brisbane earlier in January. It has been operating out of the capital on freight flights since, including several times into CQ on the Brisbane to Maryborough, Bundaberg and Gayndah run. Also, up until Monday 23 January, fellow GAM Air AeroCommander 500-S VH-UJN had been operating the freight run between Emerald and Longreach, and it flew to Brisbane late on Monday evening. 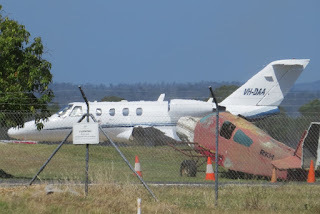 Also spotted at Emerald Airport during the late afternoon on Tuesday 24 January was the familiar sight of the smart little Vanderfield Pilatus PC-12/47 corporate turbo-prop VH-WPH which had earlier arrived from its Toowoomba base. And resting nearby also at Emerald Airport on Tuesday 24 January was Corporate Air / Vee H Aviation Cessna 441 VH-VED. While its exact movements are not known, it has been noted flying around various parts of Central Queensland in recent weeks including Emerald, Clermont and Mackay. VH-VED was noted visiting Mackay Airport last Thursday 19 January. Finally, in the background eagle-eyed spotters will see GAM Air Dornier DO 228-202 VH-VJN which operated the week-daily freight run into Emerald Airport from Brisbane via Biloela / Thangool Airport also on Tuesday 24 January. It later departed to Rockhampton and Brisbane. An interesting arrival into Bundaberg Airport on Monday 23 January was Pel Air Aviation / Regional Express (REX) SAAB 340B VH-ZRY. The SAAB touched down direct from Sydney as PFY9880. The flight looked to be a closed charter. Local plane spotter Micah S popped out to Bundaberg Airport as the sun was setting and managed a couple of nice photos as VH-ZRY was parked up for the night. And perhaps more interestingly, VH-ZRY departed Bundy early on Tuesday 24 January as PFY9281 for Bankstown - Sydney's general aviation airport. It then completed the short hop back to Sydney as PFY9802. I'm unsure if the exact reasons for the visit of the SAAB or the possible reason for the charter. Sincere thanks to Micah for taking the time to capture and send through these great photos! 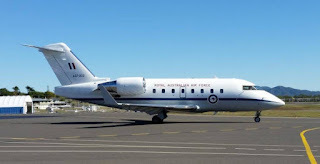 On Monday 23 January, Royal Australian Air Force (RAAF) Canadair CL-600-2B16 Challenger 604 bizjet A37-003 of the VIP 34 Squadron in Canberra was noted completing a missed approach at Longreach Airport. A37-003 was reportedly on a flight from Townsville to Canberra and was heard to be using the radio callsign of "Envoy 30". Amid a few departures of various airliners from Australian skies, the second Embraer ERJ-140LR (ERJ-135KL) regional jet for JetGo Australia arrived in Australia last week on completion of a week-long delivery flight from the United States of America (USA) via Canada, Alaska, Russia, Japan and The Philippines. 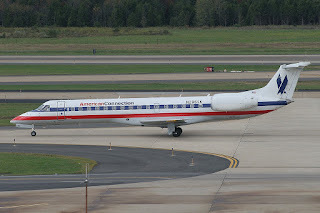 The ERJ-140LR still wears its American registration marking of N295SK which it operated for Republic Airways Holdings, which provides regional services to the major network carriers in the USA. It has been repainted into JetGo Australia livery and will ultimately wear Australian registration VH-ZJE when it enters service. N295SK was noted arriving in Australia at Horn Island in Far North Queensland from Francisco Bangoy International Airport / Davao International Airport in the Philippines on Wednesday 18 January. It continued to Brisbane Airport where it arrived after dark. It was spotted resting on General Aviation (GA) Apron at Brisbane Airport early on Thursday 19 January, alongside now sistership and fellow ERJ-140LR (ERJ-135KL) VH-ZJG (ex N297SK) which was delivered JetGo in October - see Blog post HERE. UPDATE! On Sunday 22 January, VH-ZJE was spotted again at Brisbane Airport now wearing its Australian registration marking. During the delivery flight N295SK was noted using the flight number and callsign of JG99 ("JetGo 99"). VH-ZJE / N295SK (cn 145513) is the second of two 44-seat ERJ-140LRs that were due for delivery to JetGo. JetGo is also reportedly due to take delivery of a larger 50-seat Embraer ERJ-145LR during the middle part of this year. It is reported to be N577RP which is also operated for Republic Airways Holdings. Presently, JetGo flys the 44-seat Embraer ERJ-140 VH-ZJG alongside two 37-seat Embraer ERJ-135LRs - VH-JGB and VH-JZG - on its regular public transport (RPT) and Fly-in Fly-out (FIFO) networks across three states along Australia’s east coast - including to Rockhampton Airport. The original ERJ-135LR aircraft that JetGo commenced operations with in 2012 - VH-JTG - departed Australia for good in early December 2016 - see Blog post HERE. 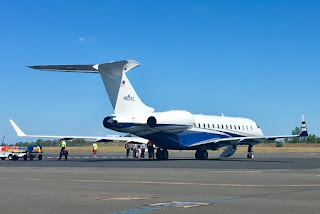 On Saturday 21 January, Pratt Aviation Bombardier BD-700-1A10 Global Express bizjet VH-VGX was photographed by local plane spotter Michael F soon after it arrived into Gladstone Airport from Melbourne (Essendon) Airport. 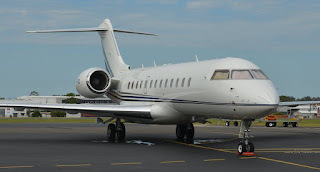 It is suspected that the visit of the big Global Express coincided with the visit to Gladstone of some of the biggest names in Australian rock music with Jimmy Barnes being joined by Noiseworks front man, Jon Stevens and classic rockers the Radiators, performing at the local Marly Brown Oval. Seemingly after the concert was complete, VH-VGX departed Gladstone Airport for Brisbane where the concert series moved to on Sunday 22 January. Of interest, there was another 'charter' of sorts into Gladstone Airport also during the afternoon and evening of Saturday 21 January with Altitude Flight Operations (New South Wales) Metro II VH-SSV flying in from its Archerfield base via Brisbane. It too departed after dark, flying back to Brisbane before making the short hop back to Archerfield. Finally, an interesting and out-of-the-ordinary movement into Gladstone Airport late on Friday 20 January was QantasLink (Cobham Aviation) Boeing B717-200 VH-YQT which arrived from Brisbane as QJE1700. It looks like the flight could have been a charter, although it was possible that QantasLink were clearing a possible 'backlog' following the reported problems of their Sunstate Airlines Dash-8-Q400 turboprops during the week. VH-YQT returned to Brisbane a little later in the evening, re-positioning empty as QJE6200. Sincere thanks to Michael for taking the time to capture and send through these great photos of a great corporate visitor! 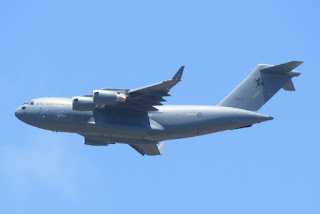 RAAF Airbus A330/KC-30A (MRTT) A39-002 Missed Approach at Rockhampton Airport Friday - Plus More! On Friday 20 January, Royal Australian Air Force (RAAF) Airbus A330-200 / KC-30A Multi Role Tanker Transport (MRTT) A39-002 was spotted completing a missed approach at Rockhampton Airport as "Dragon 12". Local plane spotter Kayanne H was at the right place at the right time (her backyard) as the KC-30A approached Rocky from the North before completing the overshoot and pulling up out of the approach right over the top of her place! Following the missed approach, A39-002 continued South to RAAF Base Amberley. It has been interesting to note that most examples of RAAF aircraft have taken to the air again this week following the Christmas / New Year period stand-down. Late on Thursday 19 January, RAAF Boeing C-17A Globemaster III A41-212 was heard using the radio callsign "Stallion 20" completing low-level operations between Emerald and Clermont before continuing to Mackay. It seems to have flown up from Amberley. RAAF Boeing B737-7DT( BBJ) A36-001 was noted completing airwork at CQ Airports twice this week. On Wednesday 18 January, it was noted flying up from Canberra and completing a missed approach at Longreach Airport. It then continued onward to Mt Isa for more airwork before returning South to Canberra. 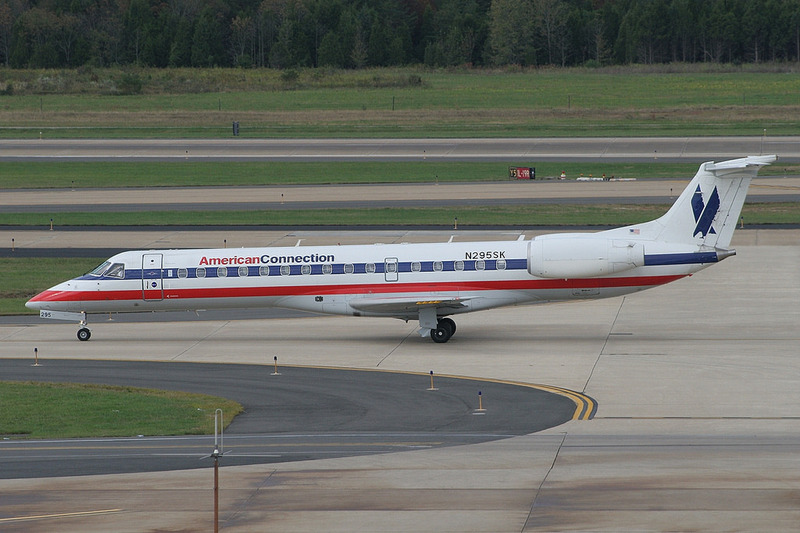 A36-001 was heard to be using the radio callsign of "Envoy 23". 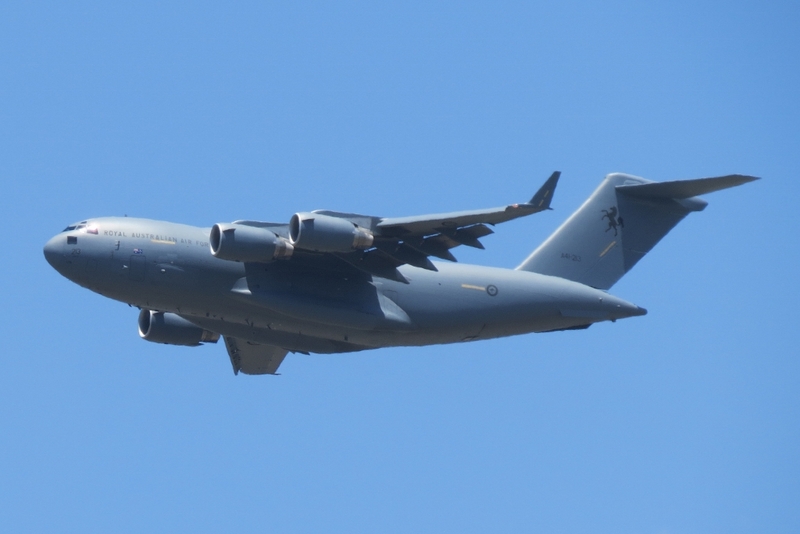 While on Monday 16 January, A36-001 was noted flying up from Canberra and completing a missed approach at Hamilton Island Airport. 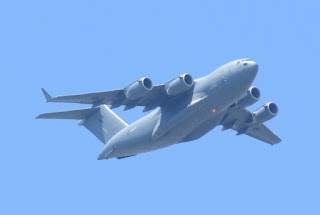 It looked to return to the nation's capital and was noted using the radio callsign of "Envoy 12". Finally, on Tuesday 17 January, RAAF Beech B350 Super King Air A32-426 was noted completing airwork around Hamilton Island and the Whitsundays as "Dingo 3" while on a flight from and back to its Townsville base. Sincere thanks to Kayanne H for taking the time to capture and send through these great photos! Making a rare trip South from its (normally) Cairns base on Friday 20 January was the Queensland Police Service (Airwing) Cessna 208 Caravan VH-PSV. It flew South from Cairns to Townsville and then Mackay Airport before continuing to Rockhampton Airport. It then returned to Townsville and Cairns. VH-PSV could have possibly been operating one of the three-times-per-week prisoner transfer flights up and down the Queensland coast. Of interest, VH-PSV is one of three Cessna 208 Caravans - along with VH-PSQ and VH-PSY - that the Queensland Police Service (Airwing) operated from bases in Brisbane, Cairns and Mount Isa.